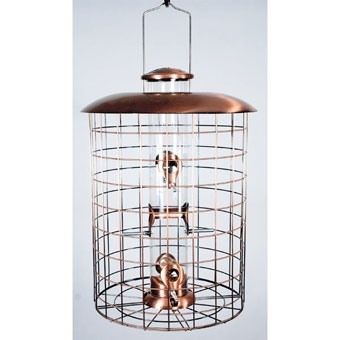 Brushed Copper Caged 6 Port Seed Feeder is a squirrel-resistant feeder featuring powder-coated, brushed copper metal 1.5 square grids which make it easy for birds to feed and move around, while protecting them from predators. Polycarbonate tube. Capacity: 1.25 lbs. seed. 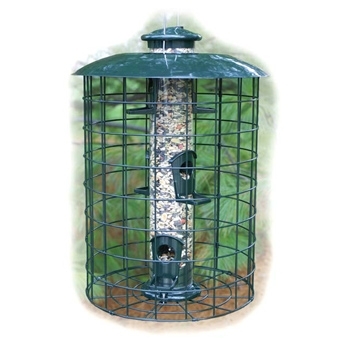 This 6-port caged mixed seed feeder features squirrel resistant, powder-coated metal grids making it easy for birds to feed and move around while being protected from predators. 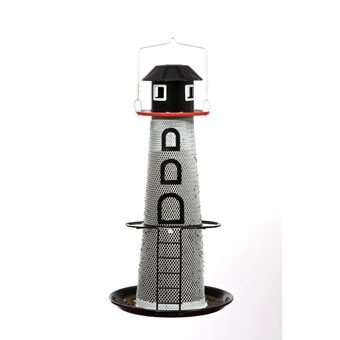 Constructed using a die cast steel top and bottom and a polycarbonate tube it comes fully assembled. Can be mounted on a 1 pole-no bracket required. Squirrel-proof bird feeder post assembly. 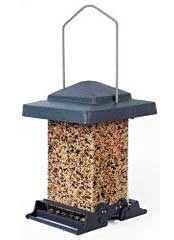 With Squirrel Stopper you can feed the birds, without feeding the squirrels. Assembles in minutes without tools. Includes attachable auger to allow for easy installation in any type of ground. 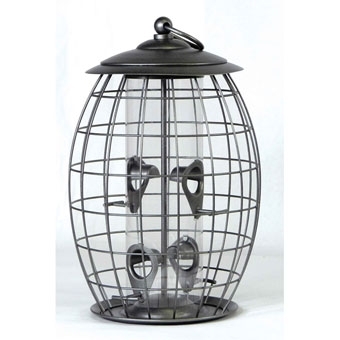 Accommodates any style hanging bird feeder or hanging plant. 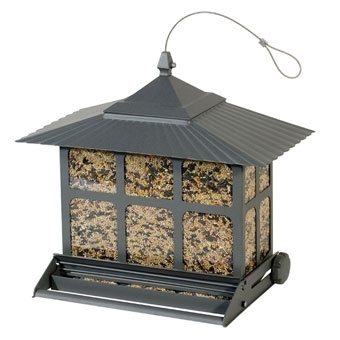 (bird feeders not included) Durable steel construction - Rust resistant. 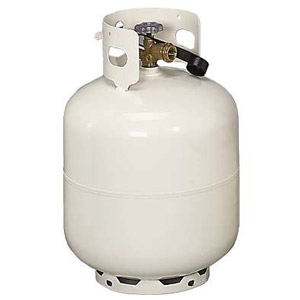 Features a squirrel-resistant design, adjustable weight settings, and a durable steel body that is powder coated for a long lasting, rust-resistant finish. 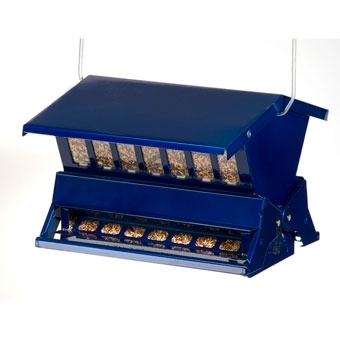 Seed saver baffle reduces wasted seed, and seed level indicator windows let you see when the feeder needs to be refilled. Exclusive Toploc feature holds top open when filling and allows one-handed filling. Hanger and pole mounting hardware included (Poles not included). Capacity: 1 1/2 Gallons. Holds 12lbs. of seed. Weight sensitive bar prevents squirrels from feeding. Patented Sure-Lock cap system helps keep squirrels out. Can be hung or pole mounted. All metal design, feeder captures energy through a solar cell in top, powering an LED to illuminate it with a nice glow at night. 14 inches tall. 1.5lb. Nyjer seed capacity. 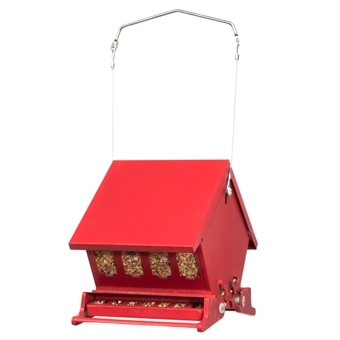 Features a 3 lb capacity, 6 heavy duty mixed see ports, metal tops, bases and an 11 squirrel proof steel cage to keep the squirrels out of your seed supply. 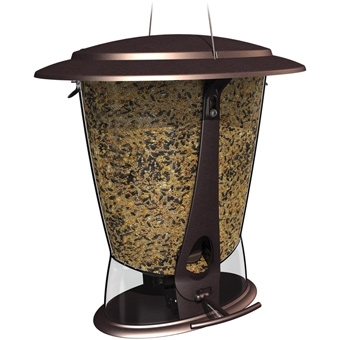 This hanging feeder features the easy clean snap out base. Capacity of 4 pounds. Wire prevents squirrels from chewing on feeder. 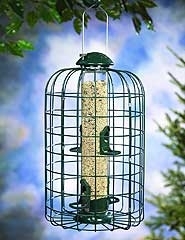 4 3/4 inches in diameter 21 inches long 4 port Squirrel Proof sunflower feeder. 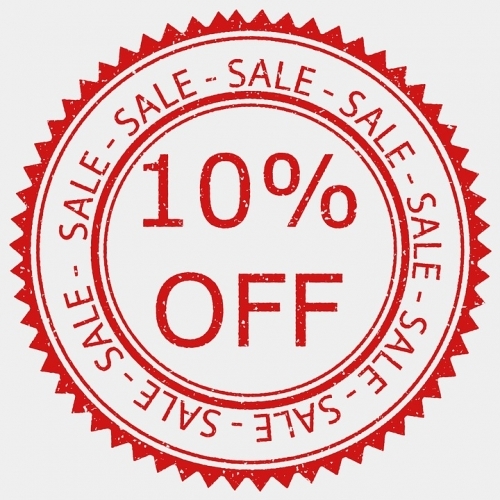 With batteries and battery charger. Colorful box. Holds 3.9lbs of seed. Tapered design with decorative brushed copper finish and locking metal roof. Functional roof tilts when stepped on by a squirrel to close both ports. Holds 4.2lbs of seed. Beautiful elliptical design with decorative satin nickel finish and locking metal roof. A simple, effective design of weight sensitive perches that will only support smaller songbirds. Squirrels, starlings, jays and grackles get the boot! Other features include corrosion resistant hardware, stainless steel roof clips, and a life-time warranty against squirrel damage. The tube measures 5 inches in diameter by 18 inches in length. 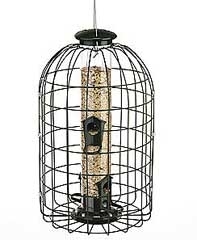 Cage provides small birds with a comfortable feeding sanctuary away from large birds. Roof helps keep seed dry. Built-in catch tray. Multiple feeding perches for birds. Features protective grid work to keep squirrels out. Durable construction featuring unique metal seed ports will allow years of enjoyment. 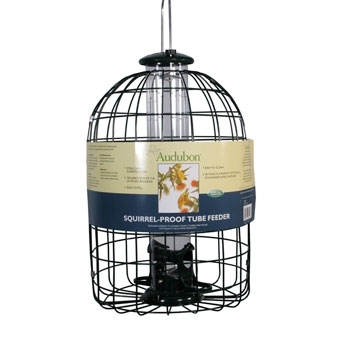 The Squirrel Resistant Caged Tube Feeder helps keep squirrels and larger birds out of the feeder. Holds a variety of seeds. Easy to fill and clean. Capacity: 1.25 lb. 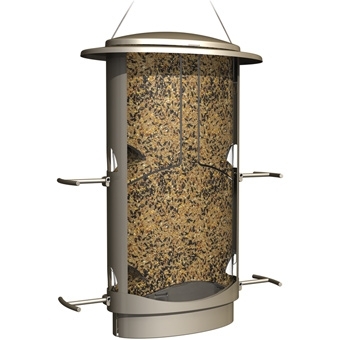 The Absolute II Squirrel-Resistant Blue Feeder is the double sided version of the Original Absolute. 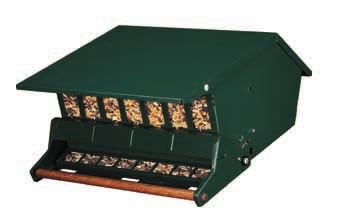 Adjustable weight setting on spring-operated perch closes squirrels' access to seed. Includes hanger and pole-mounting hardware. Easy to fill and clean. Capacity: 12 lb. of seed.